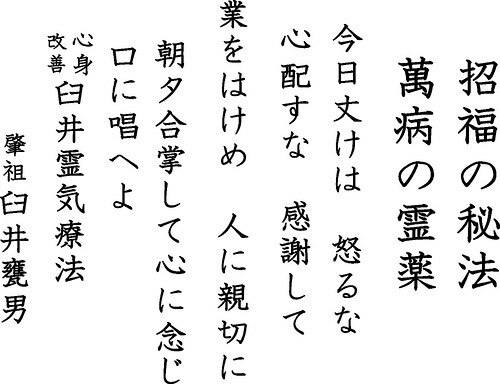 An ancient Japanese healing method, Reiki (pronounced ray-kee), is literally moving energy around the body. Basically, a practitioner channels energy in and around the human body, freeing up the flow. This releases the body's healing ability. 1.I will not be angry. 2. I will not worry. 3. I will be grateful. 4. I will do my work honestly. 5. I will be kind to every living thing. :sidebar: Many people are skeptical or uneasy with these ideas...maybe unsure simply from lack of familiarity. I myself have never had an energy healing, but know one practitioner personally. As with the overall purpose of this site, I hope to give a window of information so you may consider all the options available for holistic care of your health. You then will be able to choose well, to pursue what works for you. You may wonder how this could work. Through a reiki therapy session, a practitioner--or healer--taps into the life energy of the client and redirects the flow to where it's needed. Read on to learn what to expect during a session. Usually, you enter a quiet room, often with candles lit and gentle music playing. You recline on the table--similar to a chiropractor's or massage table. 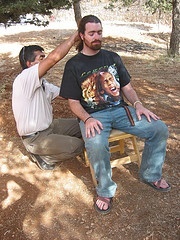 In the picture at right, the energy healing took place seated in a chair outside, as part of a natural retreat setting. Next, the practitioner assesses the energy in the air around you. Finally, she or he begins to gently move their hands over you, beginning at your head and moving all the way down to your feet. This feels like a gentle pressure, not a massage or manipulation. You may choose to receive the treatment in silence, or ask as many questions as you like. My research revealed that the practitioner learns a great deal about the client...their personality, talents, feelings, even deep blockages or obstacles present. If a client prefers to know, the practitioner relays this information on to them. I've read that the sensation afterwards is like having a knotted piece of string untangled. Patients report that complications or turmoil is now in perspective and their direction clear. For a photo and description from Jan Attkins, healer and Reiki practitioner, follow this link to her site in the United Kingdom! Explore how to choose your own practitioner here. Or, return from Reiki page to Home Page.